The sky hangs shrouded in greys today, and the ground increasingly blanketed with fallen, dying leaves, even as flashes of fading autumn glory continue to cling to trees above. That all seems very appropriate for Veterans Day today. I hung out my 13-star American flag, signifying America’s founding colonies. And my soul feels heavy today, but not overcome. I offer this post humbly to honor all veterans, living and dead. But I am personally prompted by two veterans who have passed away, and not in the romantically heroic manner of a battlefield death. Sadly John Zeh is not listed among those late veterans names etched in the beautifully magnificent and understated Vietnam War Memorial in Washington, an oversight in my opinion. John was a great guy, a good husband and father, and a funny fellow, and is still deeply missed. 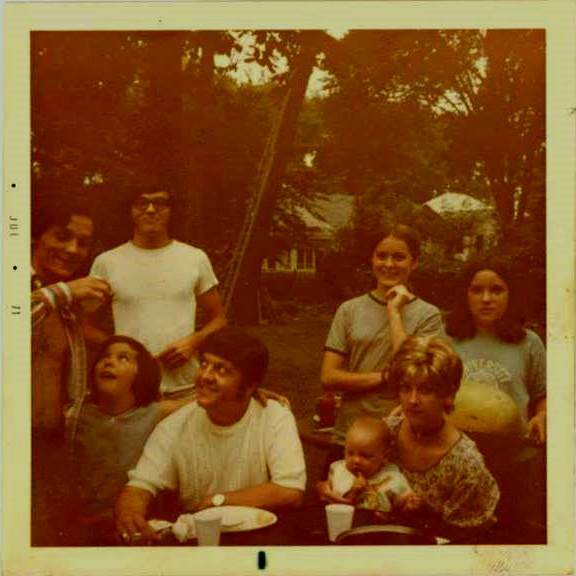 In 1971, my late cousin John Zeh sits in the middle foreground, after his return from Vietnam War service. He wore a wig due to baldness incurred by chemotherapy for Agent Orange, the Vietnam War-era affliction which ultimately killed him. This happy occasion also includes (from left) John’s brother Bill Zeh, my sister Anne, myself, my sister Betty, John’s wife Karin Zeh and their child Teri, and my sister Sheila. The second departed veteran was a very close friend of mine, Jim Glynn who died in October of 2004 of bladder cancer, which I am convinced arose from his need to use catheters for all the post-war years he lived vibrantly as a paraplegic disabled veteran. Jim is well-known in the Milwaukee music community for his popular, long-time eclectic jazz radio program on WMSE, also as a flutist-percussionist, and a grade-A culture vulture who consistently, despite his disability, directly supported and attended countless arts events in our community. 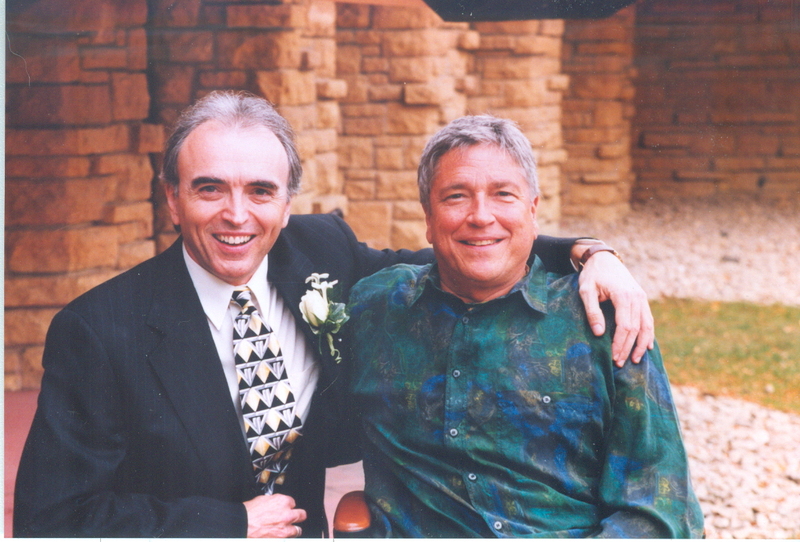 Disabled veteran Jim Glynn, right, served as the best man for my wedding in October 1997..
Jim also served during the Vietnam War although he was stationed in Europe. One day he was riding in a Jeep which lost control. He was thrown from the vehicle and the catastrophic injury to his legs left him paralyzed, unable to walk ever again, without crutches. I recently had the pleasure to selected some CDs from his magnificent music collection, which he bequeathed to me, but his sister Shannon has kept it stored for some years and we agreed to allow it to be offered among certain friends and disc jockeys. It was a joy to see his collection again. The collection reportedly will be digitally filed and made available online by WMSE. Roaming through the boxes of CDs was a sweet experience that also reached in and pressed on my heart like a great elegy. I have done radio music programs in the past and I hope to do a music program after I finished my novel about Herman Melville. I look forward to the opportunity to play some of the music from the Jim Glynn collection. Speaking of Melville, I offer, on this Veterans Day, one of his wonderful poems “Shiloh: A Requiem” from his book of Civil War poems, Battle Pieces and Aspects of the War, from 1866. It’s an alternative viewpoint to the brilliant and overwhelming immersion of Ken Burns’ recent documemtary TV series The Vietnam War. 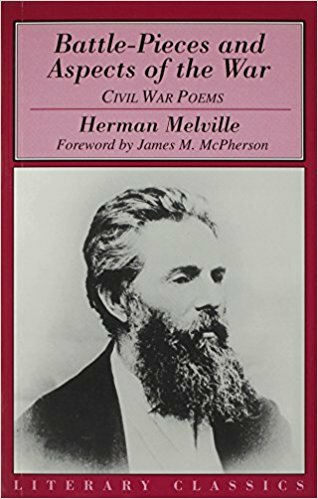 I also offer this because I think the poem resonates to America today, even though Melville wrote it shortly after the Civil War, and with that great conflict as his subject. Yet the poem reaches far beyond its time, because America today is stricken with great internal conflicts, mired in the same subjects the Civil War was fought over — the profound American stain of racism, and the desire to “preserve the Union” as President Lincoln put it. Today we suffer from deep schisms over race, that lacerate the nation’s soul, and from the way the current presidential administration seems, for so many, like an increasing threat to our sacred American democracy and way of life, as exemplified by our national motto E pluribus unum: From many, one. Melville’s complex attitudes toward war were far less optimistic and patriotic than Walt Whitman’s better-known Civil War poems, “Drum-Taps” from Leaves of Grass. In addressing Melville’s point of view, I turn to the great poetry critic-scholar Helen Vendler from “Melville and the Lyric of History,” one of the supplemental essays in the Prometheus Books edition of Battle Pieces and Aspects of the War. “Melville can never focus on one aspect, is never content to be single-minded: the costs borne by the brave men drowned in the Tecumseh must haunt the close of Melville’s victory narrative, just as the college colonel, in the brilliant poem of that name, cannot forget, as he leads his exhausted but victorious regimen home, the unspeakable truth that came to him in battle. Shiloh is not a poem about victory, it commemorates fallen veterans on both sides of the war. This reflects, to me, the most generous and courageous of spirits as a poetic observer, even if it was too challenging and equivocal for much of Melville’s readership then, and it remains, at times, challenging for contemporary readers. But Battle-Pieces is immensely worthwhile and enjoyable, one of the still-underappreciated masterworks of perhaps the greatest of American creative writers. Finally, as a Veterans Day postscript, I offer you an opportunity for a bit of activism, specifically this petition for a cause to benefit severely disabled veterans. Online Melville text courtesy The Poetry Foundation. 1. Helen Vendler, “Melville and the Lyric of History,” supplemental essays to Herman Melville’s Battle Pieces and Aspects of the War, Prometheus Books, 2001, 260-261. 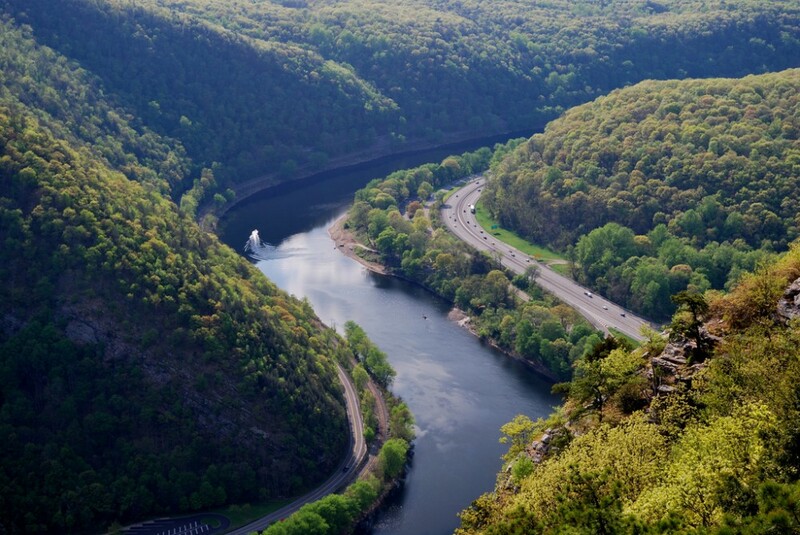 This entry was posted in Culture Currents (Vernaculars Speak) by Kevin Lynch. Bookmark the permalink. Kevin Lynch what a wonderful tribute to our heros…Thank You for being so thoughtful and eloquent. Jim Glynn is a musical gem this Milwaukee Listening Community is blessed with, his musical contributions and determined will power will be remembered into eternity. Someday we may catch up to his endlessly expanding musical genius, broadcast into the cosmos, radio waves and signals endless, always available to be tuned into and on to from anywhere and everywhere. I am looking forward to hearing his muse and his Miles Davis story again, “Hey man what do you want to hear?”, asked Miles Davis as he wheeled Jimmy into Miles’ concert. Tom, thanks for your expansive, cosmic comment, your memory of Jim’s unique presence and for the reminder of the Miles and Jim anecdote. With appreciation to our friends, family, and fellow Americans who have served our country. Thank you for the tribute Kevin. Ha. There are so many Jim Glynn stories. The first time I saw him I was driving my car down Kenwood boulevard by UWM going about 15-20 miles per hour. He passed me on some super-long crutches and had been sitting in class for 10 minutes before I arrived. He saw the amazed look on my face when I said, you are amazing, what’s your name. He put out his hand and said, Hi, I’m Jim Glynn. Twenty years later we went to see Cecil Taylor in Chicago at the Showcase. After Cecil had played the first hour of his first 3 hour set. (the second one was 3 hours too) The cops came in to stop Cecil and close the place down for a code violation. It appeared there was going to be a riot. The 3 cops looked afraid. Jim hollered out in a humorous way. “It’s OK brother. We’ve heard enough” Everybody kind of agreed in a humorous way and even laughed a little and filed out in a happy mood. Jim was amazing. He would out-swim me going around the quarry perimeter by about 10 minutes, and I was using my legs AND arms. Then I would stop and rest on the shore and watch Jim do a second lap in 30 minutes. 40 years later, Jill and I went to say goodbye a few hours before he died. Normally when a friend dies, I can feel his presence for a while as they slowly leave this world behind. But when Jim died, I think he had had enough of the struggle he waged so courageously fought. When he died he was free at last and was gone. But I think he went swimming at the quarry one more time and is still there. The first time I went to the quarry to swim 3 months after Jim had died, I saw his usual wheel chair marks in the sand, going to the water. The tracks were one way, to the water and not away from the water where they usually were after he was done swimming. Will someone please supply the details of the Miles Davis story? The first time I met Jim I was playing piano at a party at a farmhouse. After playing I went to relax in the living room which contained an old upright. Jim, had a conga drum in front of him and asked if I would play. I was a little reluctant as I had just finished performing but I complied as I sensed that he really wanted to play. He played with great intensity immediately. When I had a chance to look over at him I was struck with his immersion in the music. His head was turned heavenward, his eyes closed in blissful intensity. We played the same song for what seemed to be 45 minutes! I would have stopped much earlier but he just kept on rocketing through the cosmos. Cousin Kevin, what can I say that hasen’t already been said. Your tribute to my brother John and your friend Jim were so spot on in their relevance to the years gone by. Hero’s whose names should have appeared on that wall but probably never will. What matters is that deep in our hearts we carry the memories of each one of them, happier days, lives ended way too soon. On certain days we especially remember as tears well up and a gentle smile of knowing they are with us always. God bless you and your way with words!